In Ether #1, science meets fantasy as interdimensional explorer Boone Dias gets mixed up in the mysteries of the fantasy world in this new adventure. Boone Dias is a scientist from Earth with a revered reputation for finding an explanation for everything, including asserting that magic is perfectly scientific. Is there are a weird and wonderful explanation for all occasions? This title explore just that very idea. He has been enlisted enlisted by Ether’s magical residents to discover the truth surrounding their most difficult to solve crimes. The interdimensional traveller’s fame and his ability to explain the most obscure of phenomena is proving to throw up some unique challenges. Matt Kindt (Past Aways, Super Spy) is the writer responsible for this project, he is uniting with artist David Rubin (The Fiction, Mighty Morphin Power Rangers). Rubin’s art work is a smooth and arresting rendition of the mystical and the scientific, we definitely need to see more of him. 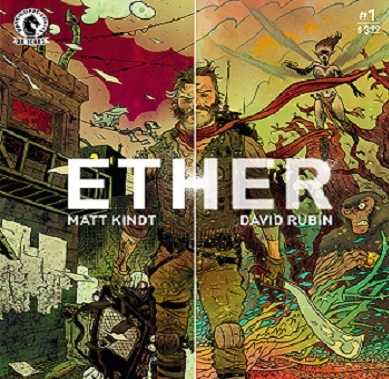 Ether #1 was published by Dark Horse on November 16th. Writer and artist Jeff Lemire (Extraordinary X-Men, Bloodshot Reborn) is providing a variant cover.